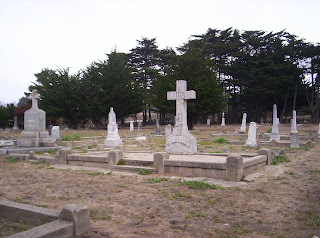 Last October on our trip to Half Moon Bay, we took a couple of little trips to the cemeteries. 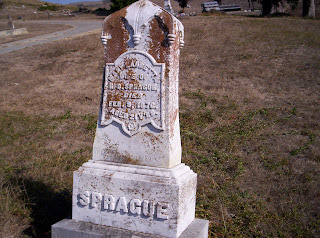 I am fascinated by old cemeteries, which we don't have where I live. They are much more modern with the flat little plates on the ground. No unique headstones. 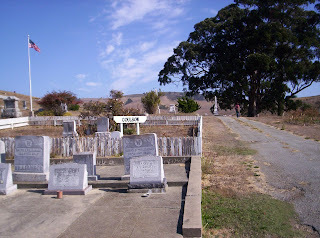 Now both of these cemeteries were deserted when we were walking around, but I swear in the one picture there is a GHOST!!! Click to enlarge and tell me if you see what looks like a guy standing near a headstone toward the back of the picture on the right. There was nobody there that day besides my husband and I. As you walk around and read the headstones you can't help but wonder who these people were. ?What were they doing in Northern California back then??? Next we decided to have dinner at the Moss Beach Distillery. It is known to be haunted. 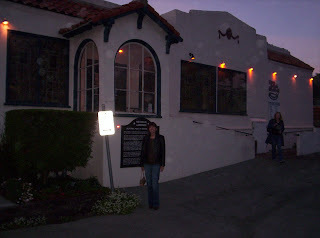 That is me standing out in front of the restaurant. Do you see all of the orbs? I have been told that orbs are the energy of spirits. There were no other pictures from this trip with orbs. SPOOKY!!! There are stories of a lady that is seen on the beach. She is also seen in the restaurant wearing a blue dress from the 1930's. I hope you are all having a spooky Halloween!!! Enjoy the day, and the trick or treaters. Enjoy the ghosts, ghouls, goblins, and the occasional witch. Have a hauntingly good time!!! Hi Friends, I've missed you!! 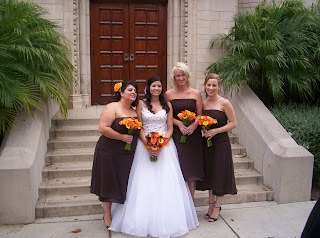 Here are the first few photos of wedding day. Everything went really well. We had a wonderful day!!! We had great Fall weather, with no smoke or heat. Yay!! 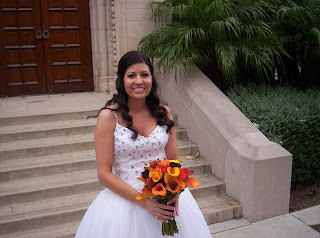 The bride was beautiful!!! She smiled the whole entire day. I will be getting more photos for you in the coming days, but I thought you would want to see a few today. I am exhausted, but in a good way. The reception we were told by many, was the best wedding reception ever. I will have more pictures of that soon. 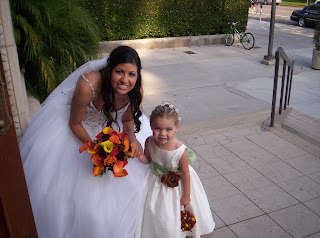 This is Amanda with Haley, one of the 3 flower girls. Mark and I before the wedding. 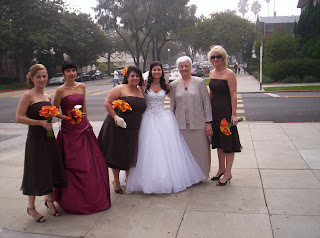 Amanda and her bridesmaids, me and my mom. 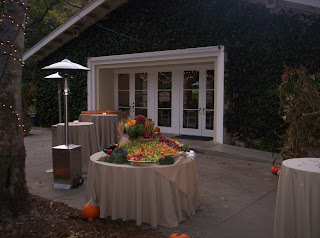 A sneak peek at the reception site. 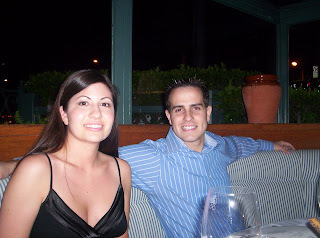 Amanda and Joe the night before at the rehearsal dinner. One more of the bride. I cannot explain what a fun, exciting and wonderful day we all had. This is the first of many wedding posts. I hope you won't get bored with them. Thanks to all of you, for your kind and encouraging words. Thanks for all of my Anniversary wishes too. Hello bloggers! I missed you yesterday and today. My computer died!!!! I now have a new computer, although I am a little frustrated right now. I am not used to the programs or this Windows Vista. Anyway I am glad to be back online with my friends. Just so you know the wind has died down, and the fires at least around here are much better. San Diego is another story. 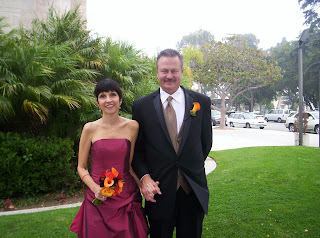 Today is our 31st Wedding Anniversary. 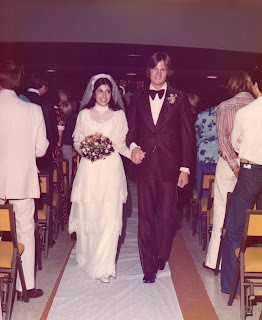 We were married on October 23, 1976. I was 20 years old at the time, and my husband was 21. I couldn't even drink champagne legally. Three days from now our daughter will be getting married. Things around here are pretty hectic. Many appointments and last minute details. I will be will be back blogging on Saturday or Sunday. I'm sure I will have wedding stories and pictures for you. Thanks for all of your many well wishes and concerns for me and my family. I found out today that my friend Jamie and her family did not have to evacuate from the fire. Jamie is my friend and not too far away neighbor. You know her blog Simply Me Art. So my friends, I will be back soon. So as you all know from watching the news today, Southern California is on fire! I woke up at 4:00 this morning, because the hurricane force winds were so loud. Next thing I knew our power went out. Then we saw a red glow through the draped window. The hill across the street was on fire. Wind, debris and embers were flying. The fire department came and got the fire pretty much out. We ran around trying to make sure there were no embers to catch anything on fire. At first I thought I better grab my daughter's wedding dress, and my dress and get out of Dodge. Things died down, but still with no power my husband said we should go and get coffee, then go to the flea market as planned. So we did just that. The flea market is near the ocean, so the air was fresh and clean. Not too much wind either. Later though the wind started up an blew the vendors stuff around. When we got home another fire had started nearby. We weren't in danger of flames or embers, but the smoke, wind, and ash was horrible. It is still very windy and smokey here, but it is OK for now. The wind should be better in time for the wedding on Friday. I'm sure you have seen pictures from Malibu. It is was pretty bad. Here are some more of the flea market pictures that I had promised. The only thing I bought today was a really great antique wood birdcage. I will show it to you soon. I guess we will have stories to tell about the last few days before the wedding. So we are all OK, as are the dresses, and the Bride and Groom. I got home from shopping this afternoon, and look what was waiting for me in my mailbox. The new Victoria magazine. YAY!! 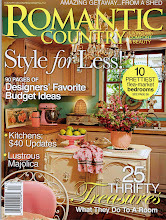 I am going to enjoy relaxing this evening, while reading my new issue. Thought you would like to see my new Christmas decoration. I got it from my friend Barbara at Garden Memories. (It has glitter on it, I had to get it). Tomorrow I am off the the Ventura Flea Market. I will take some pictures for you. It's a good diversion from all wedding, all the time. Well bloggers, 8 more days to go. We are definitely in wedding count down around here! walk around the house and look at my things. Thought you might like to see one of my favorite things right now. This red shabby cupboard I got from my flea market friend Karen. I will be seeing her this Sunday at the Ventura Flea Market. I will bring my camera for those of you who will not be attending. (Unfortunately I think that is most of you) I wish you could all come with me. Wouldn't that be fun? Anyway, this cupboard gets a lot of use. I change its contents often. It sits in my dining room. I just checked weather.com for the weather in Santa Monica next Friday,for the millionth time. So far so good. (In case you didn't know, the wedding is in Santa Monica) It's suppose to be Sunny and 70. Enough wedding rambling for today. Hope you are all having a great day/evening. By the way, I got the Spirit of Christmas award, from Julie at Nunnies Attic, but I don't know how to paste the logo to my blog. As soon as I figure it out I will post it. (I am such a computer genius) Go to http://nunniesattic.blogspot.com/ to see what it's all about. 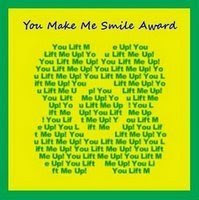 Today I was nominated twice for the, You Make Me Smile award. I was nominated by Linda of Somewhere in Time, http://somewhereintyme.blogspot.com/ , and Dena from, Come Sit a Spell http://swaddlecottage.blogspot.com/ . Apparently my blog and I make people smile. Thank you both very much for the honor. I have such a hard time nominating others for this award, simply because when I read your blogs I always smile. You are all wonderful to me. So I am nominating all of you today!! You all make me smile and laugh. Now on to the pumpkin fairy. I was browsing through the Somerset Holidays and Celebrations book/magazine. I came upon this cute idea from Natalie Hansen, Life Is A Collage http://nataliehansen.typepad.com/. It is a faux carved out pumpkin with a lot of embellishing. She is a wonderful artist, whose work is featured several times in the magazine. This one just caught my eye, and I had to try it. I happened to have most of the materials already. I did have to find a picture of a spooky house and a vintage child. If anyone has good sources for vintage photos, please let me know. I think it turned out rather well. Check out the original on page 104 in the Somerset. I emailed Natalie to tell her that I tried out her project. She was so nice and emailed me back to say that I did a good job, and that she was excited that someone loved and tried out her project. I made it yesterday, and it was a good diversion from, as my friend Jenn of Thrift Shop Romantic said, the" 24 hr. wedding channel." I hope you are all having a wonderful Monday!! Hunting, Gathering and a Hairdo! On the way back, we stopped in Ventura. Of course I had to stop in at my friend Barbara's shop, Garden Memories. I bought the Roman crown, and the glittery Christmas cones. She hadn't even put the cones out on the floor yet. I saw them behind the counter. She let me purchase them now, because by the time I get back to her shop after the wedding, I'm sure they will be gone. Speaking of the wedding, which is 13 days away now. I am thinking of having my hair put up like this picture. I want an up do, but nothing too foofy. I want simple and elegant. As if I didn't have enough Halloween decorations already, I got more. I got these kind of man in the moon/pumpkin guys at B on main, in Ventura on Saturday. The witches came from of all places Marshall's. The 3 little girl witches photo, I purchased from Donna at the Decorated House. http://thedecoratedhouse.blogspot.com/ Isn't it a great photo? She had it on her blog, and I fell in love with it. Not sure yet how I am going to use it, but you will be the first to know. This cat is a Bethany Lowe that I found at Home Goods for only $9.99, which is an amazing price if you know Bethany Lowe. The cute little bucket under the cloche, came from the dollar section at Target. The cloche I got on clearance at Marshall's, for the unbelievable price of $3. The birdhouse is a garage sale find from last week. The little cat is also a Bethany Lowe from HomeGoods. So now you have found me out. A Halloween addict!! Hope you are having as much fun as I am decorating for the season. I Received My Crown Today! Today I received my crown!! To read more about Ava Grace, go to Michelle's blog. Michelle is one of the artists who donated a piece for the auction. Thanks Michelle!! Not only is the crown beautiful, it helped raise more money for the cause. Michelle also included this pretty tag, some glittery moons and stars, and 2 pumpkin candles. (We were Halloween swap partners) I think you will enjoy Michelle's blog and her artwork. So here we are at the pumpkin farm, picking pumpkins and corn stalks for the wedding. 3 weeks to go. Me with the bride and groom. I have never ridden in a car full of cornstalks. I felt like a scarecrow. It was so worth the trip though. We got 100 baby pumpkins, small, medium and large pumpkins. All varieties and sizes, as well as cornstalks. I think they will be great as the decorations for the wedding. I hope you are all having a wonderful Fall weekend!! Yesterday, I decided to do a little project which wasn't wedding related. I made this witch fan. I saw something similar in the Somerset Holidays and Celebrations book/magazine. I used some old ledger paper for the fan, crepe paper, cardboard, wire and of course glitter. I found a vintage picture to use for the witch. I made her hat, and the star out of cardboard. I painted a stir stick black for the handle. Then I glued seam binding to the back. I glued on a button and an old rhinestone earring. Viola! Witch Fan!!! After being tagged yesterday, one of my random things was, that I had met many celebrities. I've had many of you ask who I have met. Well I started to write a list. It's amazingly long and not even finished. It's really my husbands fault. His job requires us to attend charity functions. The celebrities just happen to be there too. Sometimes they mingle with us non celebrities. So we usually start talking or go up and say hello. They are usually very nice, and sometimes we have a picture with them. Hence my wall of fame in my hallway. So in no particular order here goes a partial list. Ellen, Candice Bergen, Ronald and Nancy Reagan, Charlton Heston, Tony Danza, Gary Sinise, Faith Ford, Joe Regalbuto, Beverly Mitchell, Catherine Hicks, Keri Russell, Amy Smart, Greg Grunberg, Sela Ward, Paul Sorvino, Sharon Stone, David Crosby, Ashley Judd, Harry Hamlin, Joan Van Ark, Joyce Dewitt, Suzanne Somers, Fred Willard, Sting, Ed Begley Jr., Max Gail, Ted Danson, Mary Steenburgen, Drew Barrymore, Jane Seymour, Pierce Brosnan, Camryn Manheim, Swoosie Kurtz, Mr. Blackwell, Casey Kasem, Anthony Edwards, Christopher Lowell, Christopher Atkins, Jamie Lee Curtis, Janet Leigh, Lauren Koslow, Deidre Hall, etc. And no Susie Q, not Brian Dennehy, you will be the first to know. Now remember, this was over a period of years. Hope you enjoy that crazy list. Halloween Cottage of the Month! !